Hand signed Detroit Tigers vertical 8x10 photo with a blue sharpie by Miguel Cabrera, includes a certificate of authenticity. He is a six-time All-Star, having been selected to the National League All-Star Team in 2004, 2005, 2006, 2007, and the American League All-Star Team in 2010, 2011. Cabrera has started at least 100 games at first base, third base, left field and right field. He progressed through the Florida Marlins minor-league system, and was called up from the Double-A Carolina Mudcats in June 2003, and went on to help the Florida Marlins win the World Series that year. According to Baseball-Reference, Cabrera Is putting up statistics comparable to Hank Aaron and Ken Griffey, Jr. at age 28, and is considered one of the best hitters in baseball today. He is a very intimidating hitter, as he consistently hits the best pitchers in baseball. In 2012, Cabrera became the first player since Carl Yastrzemski in 1967 to win the Triple Crown. Cabrera led the American League with a .330 batting average, 44 home runs, and 139 RBIs. Hand signed Los Angeles Angels horizontal 8x10 photo with a silver sharpie by Mike Trout, includes a certificate of authenticity. Following an initial stint with the Angels in 2011, Trout had a breakout season in 2012, unanimously winning the American League Rookie of the Year Award, winning a Silver Slugger Award, and finishing runner-up to Miguel Cabrera in the AL Most Valuable Player Award voting. He also led the league in several statistical categories, including runs scored, stolen bases with 49, and wins above replacement (WAR) with a 10.9 mark (according to Baseball-Reference.com). Trout continued his outstanding play in 2013, finishing with a league-leading 9.2 WAR, another Silver Slugger Award, and another second-place finish for AL MVP. 2 different photos available, please contact us before buying! Hand signed St. Louis Cardinals RARE World Series vertical 8x10 photo with a blue sharpie by Albert Pujols, includes a certificate of authenticity. 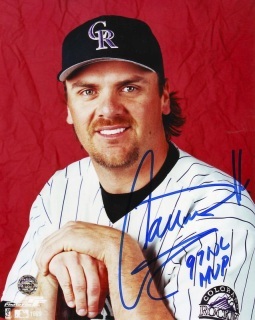 He won the National League Rookie of the Year award in 2001, and has since been selected as an All-Star nine times, and won the National League Most Valuable Player Award three times. He has also twice won the National League Hank Aaron Award, and has two World Series rings from the Cardinals' 2006 and 2011 titles. At the end of the 2011 season, he led all active players in batting average (.328), slugging percentage (.617), and OPS (1.037), and ranked 37th in number of home runs in Major League Baseball history. He was selected by ESPN.com as the greatest player of the decade from 2000–09. 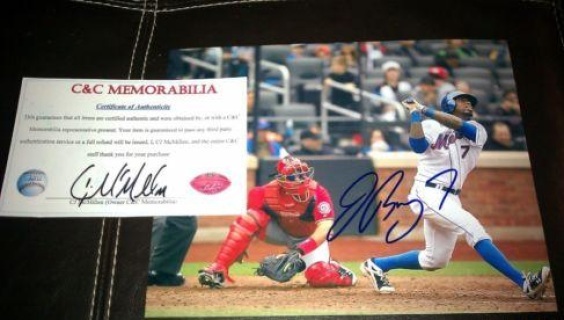 Hand signed Washington Nationals vertical 8x10 photo with a blue sharpie by Bryce Harper, includes a certificate of authenticity. Harper won the 2010 Golden Spikes Award, awarded annually to the best amateur baseball player. Going into the 2012 season, baseball prospect-watchers, including Baseball America, MLB.com, and Baseball Prospectus routinely ranked Harper as a top-3 prospect. He made his MLB debut with the Nationals on April 28, 2012. 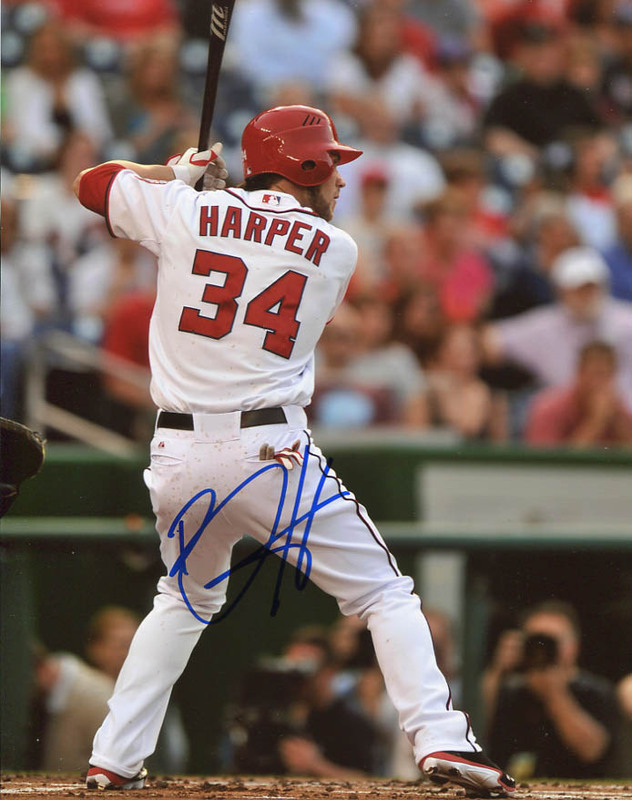 Harper was selected for the 2012 All-Star Game, becoming the youngest position player to ever be selected. ​1 available, please contact us before buying! 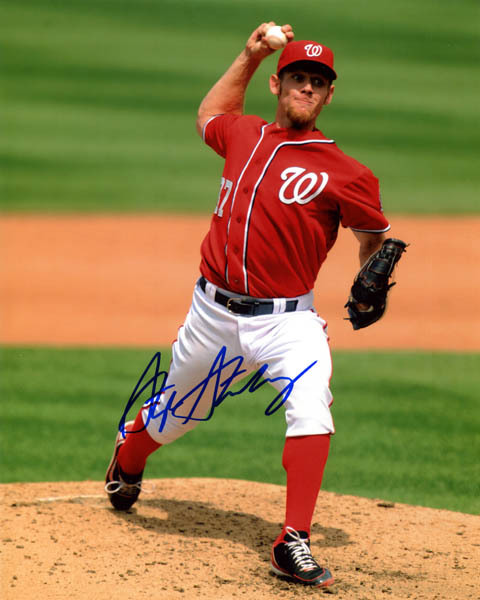 Hand signed Washington Nationals vertical 8x10 photo with a blue sharpie by Stephen Strasburg, includes a certificate of authenticity. Strasburg was called the "most-hyped pick in draft history" by ESPN and the "most hyped and closely watched pitching prospect in the history of baseball" by Sports Illustrated. Strasburg's major league debut on June 8, 2010, produced a franchise-record 14 strikeouts. Hand signed Los Angeles Dodgers 8x10 photo with a blue sharpie by Clayton Kershaw, includes a certificate of authenticity. Kershaw was drafted seventh overall in the 2006 MLB Draft. He worked his way through the Dodgers' farm system in just one full season and reached the majors at 20 years old. When he debuted in 2008, he was the youngest player in MLB, a title he held for one full year. In 2011, he won the pitching Triple Crown and the National League Cy Young Award, becoming the youngest pitcher to accomplish either of these feats since Dwight Gooden in 1985. Being a left-handed strikeout pitcher and playing for the Los Angeles Dodgers, Kershaw has often been compared to Hall of Fame pitcher Sandy Koufax. Kershaw pitched a no-hitter on June 18, 2014, becoming the 22nd Dodger to do so. He is also a three time Cy Young Award winner and the 2014 National League Most Valuable Player. Hand signed New York Mets horizontal 8x10 photo with a blue sharpie by Matt Harvey, includes a certificate of authenticity. 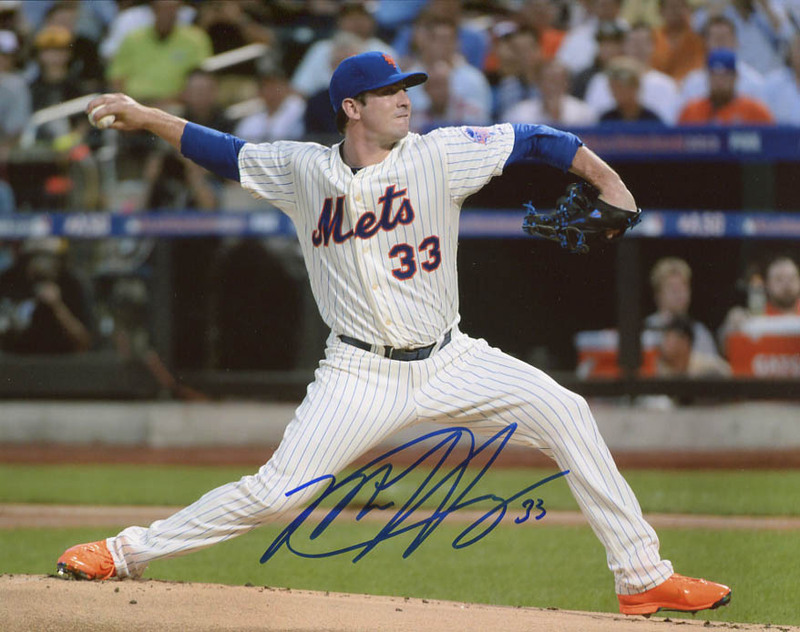 Nicknamed Dark Knight, is an American professional baseball pitcher for the New York Mets of Major League Baseball. The Mets drafted him with the seventh overall pick in the first round of the 2010 MLB Draft. In his major league debut on July 26, 2012 against the Arizona Diamondbacks, Harvey set a new club record with 11 strikeouts while earning his first career victory. Harvey was the starting pitcher for the 2013 MLB All-Star Game, which took place at the Mets' home ballpark, Citi Field in which he pitched the first inning. 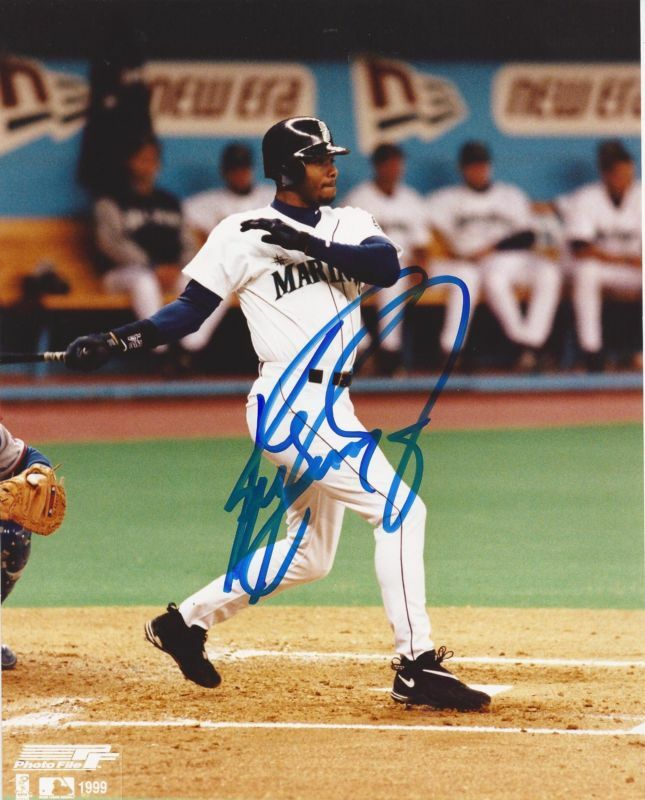 Hand signed Seattle Mariners vertical 8x10 photo with a blue sharpie by Ken Griffey Jr., includes a certificate of authenticity. He spent most of his career with the Seattle Mariners and Cincinnati Reds, along with a short stint with the Chicago White Sox. A 13-time All-Star, Griffey was one of the most prolific home run hitters in baseball history; his 630 home runs rank as the sixth-most in MLB history. Griffey was also an exceptional defender and won 10 Gold Glove Awards in center field. He is tied for the record of most consecutive games with a home run (8 games, tied with Don Mattingly and Dale Long). Considered a five-tool player for much of a career, the Associated Press noted after his retirement: "In his prime, Ken Griffey Jr. was unanimously considered the best player in baseball." Hand signed Toronto Blue Jays vertical 8x10 photo with a blue sharpie by Joe Carter, includes a certificate of authenticity from Frozen Pond. A former right fielder and first baseman in Major League Baseball who played from 1983 to 1998. 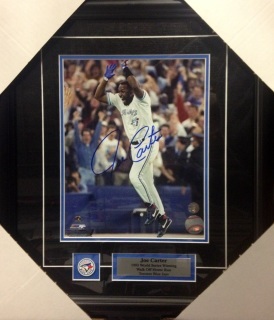 Carter is most famous for hitting a walk-off home run to win the 1993 World Series for the Toronto Blue Jays. 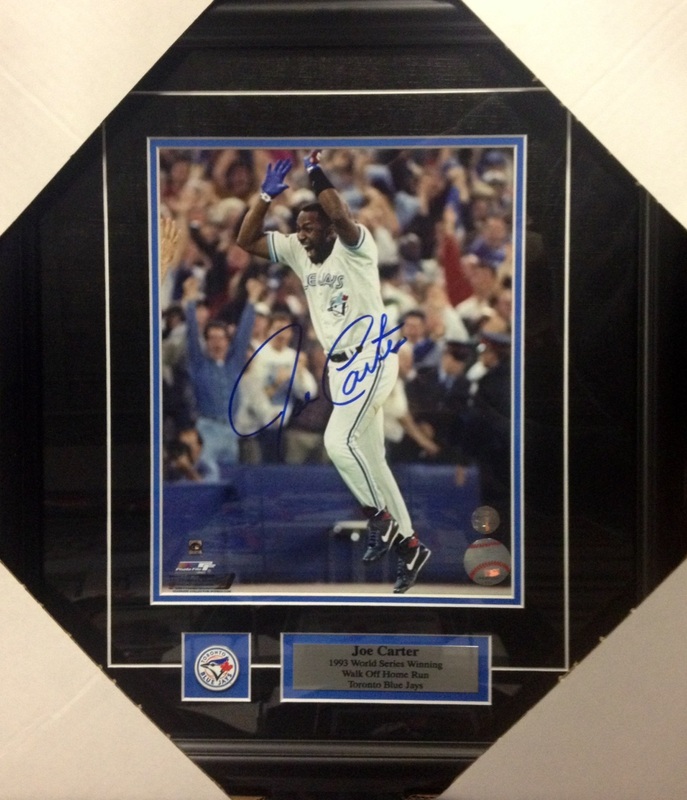 Hand signed Toronto Blue Jays pin & plate framed vertical 8x10 photo with a blue sharpie by Joe Carter, includes a certificate of authenticity from Frozen Pond. Finished size 15x17. 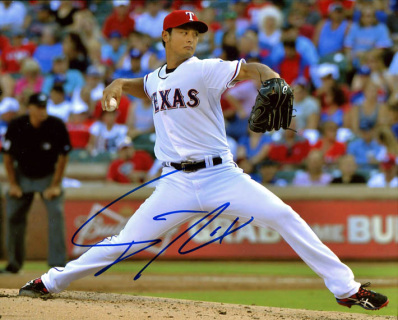 Hand signed Texas Rangers horizontal 8x10 photo with a blue sharpie by Yu Darvish, includes a certificate of authenticity. He was considered by many to be the best pitcher in Japanese professional baseball prior to his arrival in Major League Baseball in 2012. In his first MLB season, Darvish finished third in the American League (AL) Rookie of the Year balloting. The next season, he finished second in the AL Cy Young Award vote as he led the Major Leagues in strikeouts with 277 and finished fourth in the AL in earned run average (ERA) at 2.83. On April 6, 2014, Darvish reached the 500 strikeout plateau in fewer innings pitched than any other Major League pitcher in history. Hand signed Florida Marlins RARE Rookie of the Year Collage vertical 8x10 photo with a blue sharpie by Hanley Ramirez, includes a certificate of authenticity. A shortstop in Major League Baseball for the Florida Marlins. Ramírez was named 2006 NL Rookie of the Year by the Baseball Writers Association of America. In 2009, Ramírez won the NL batting title and is a three-time All-Star starter. Additionally, Ramirez finished runner-up in the 2010 Home Run Derby. Hand signed Colorado Rockies vertical 8x10 photo with RARE "97 NL MVP" inscribed with a blue sharpie by Larry Walker, includes a certificate of authenticity. Walker's career season came in 1997, when he hit .366 with 49 home runs, 130 RBI, 33 stolen bases, and 409 total bases, en route to becoming the first Canadian player to win the MVP Award. He became and remains the only player to have at least 25 stolen bases and a slugging percentage of more than .700 in a season. Walker's 409 total bases in 1997 were the most in an NL season since Stan Musial's 1948 season, although the mark was bettered by Barry Bonds in 2001 (411). In 1998, Walker won the Lou Marsh Trophy as Canadian athlete of the year after finishing runner-up the previous year to Formula One champion Jacques Villeneuve. 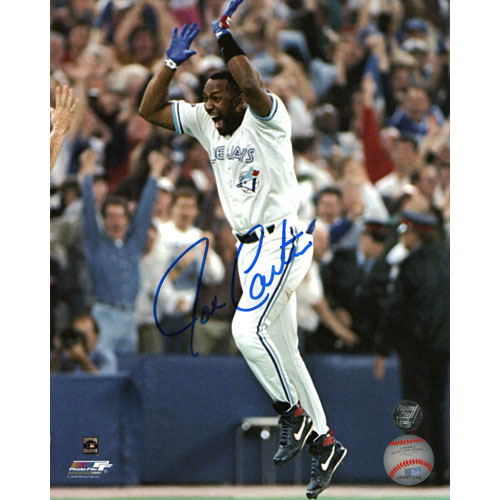 He won the Tip O'Neill Award as Canada's top baseball player 9 times in his career. No other player has won it more than 3 times in their career. Hand signed New York Yankees vertical 8x10 photo with a blue sharpie by C.C. 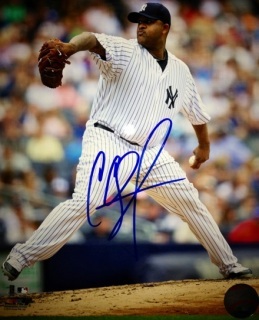 Sabathia, includes a certificate of authenticity. Upon signing with the Yankees prior to the 2009 season, Sabathia became the highest paid pitcher in Major League Baseball history. Sabathia played the first seven and a half seasons of his career with the Cleveland Indians, where he won the 2007 AL Cy Young Award. He played the second half of the 2008 MLB season with the Milwaukee Brewers, leading them to the NL Wild Card, their first playoff appearance in 26 years. Sabathia is regarded as one of the most durable pitchers in Major League Baseball, having easily amassed an average of over 200 innings pitched per season during his career. 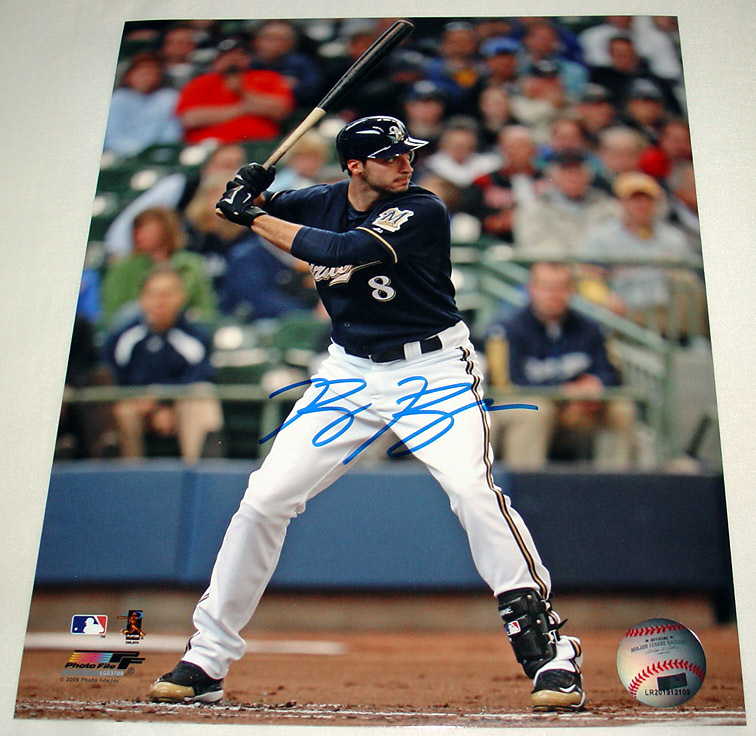 Hand signed Milwaukee Brewers vertical 8x10 photo with a blue sharpie by Ryan Braun, includes a certificate of authenticity. A perennial standout, he was ranked No. 16 by the Sporting News in its 2011 list of the 50 greatest current players in baseball and is the reigning National League MVP. Braun won the National League Rookie of the Year Award in 2007. He was voted a starting All-Star and won the NL Outfielder Silver Slugger Award in each of the past four seasons (2008–11). Hand signed Philadelphia Phillies horizontal 8x10 photo with a blue sharpie by Ryan Howard, includes a certificate of authenticity. Howard was the 2006 National League MVP. 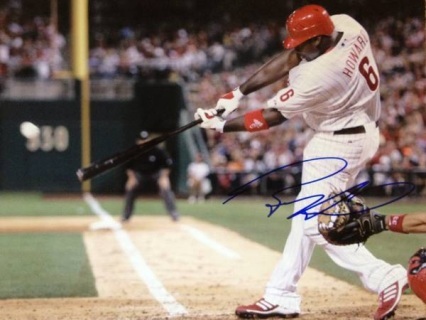 Howard is the fastest player to reach both the 100 and 200 home run milestones in Major League Baseball history, passing the marks in 2007 and 2009, respectively. Hand signed Texas Rangers RARE Sports Illustrated cover vertical 8x10 photo with a blue sharpie by Josh Hamilton, includes a certificate of authenticity. After his torrid start to the 2008 season, Hamilton was named to the American League All Star team, and made the All-Star team the next two seasons as well. He also participated in the Home Run Derby, where he hit a record 28 home runs in the opening round and finished with 35 home runs, which was second-most all-time in derby history. Hamilton won the AL batting title in 2010. 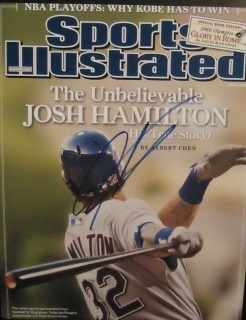 On October 22, 2010, Hamilton was selected as MVP of the 2010 ALCS. On November 23, 2010, Hamilton was named the 2010 AL MVP, earning 22 of 28 first-place votes. Hand signed Minnesota Twins RARE Gold Glove horizontal 8x10 photo with a blue sharpie by Joe Mauer, includes a certificate of authenticity. 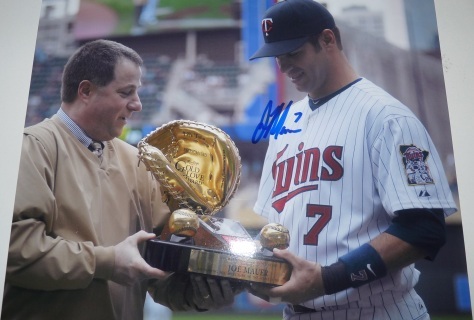 A Major League Baseball catcher for the Minnesota Twins. Mauer is regarded as one of the best defensive and offensive catchers in baseball. He is the only catcher in Major League history to win three batting titles. He has also won three consecutive Gold Glove awards (2008–2010), and the 2009 AL MVP award. 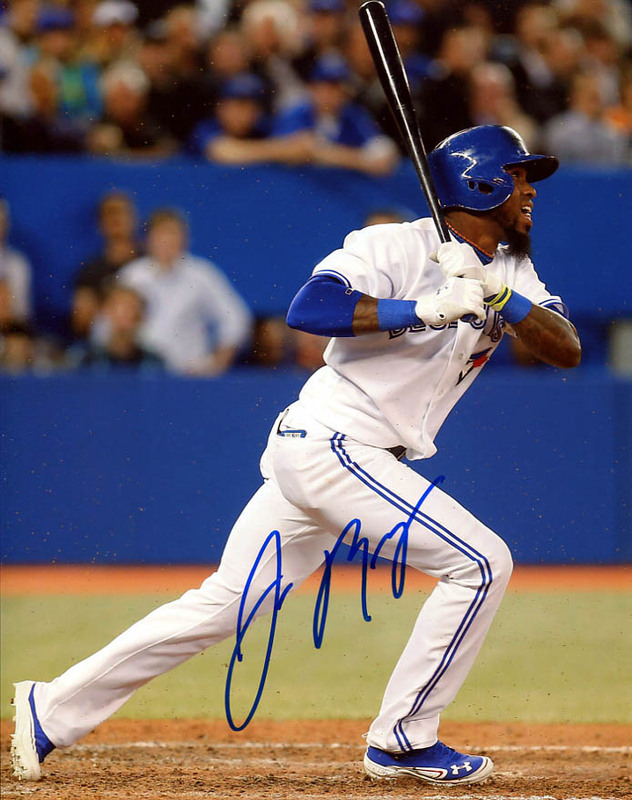 Hand signed Toronto Blue Jays vertical 8x10 photo with a blue sharpie by Jose Reyes, includes a certificate of authenticity. Reyes is a four-time All-Star and led the majors in triples in 2005, 2006, 2008, and 2011. 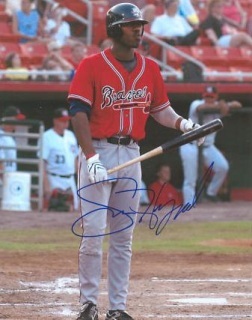 Reyes also led the National League in stolen bases in 2005, 2006, and 2007. He was the NL batting champion in 2011. He is also the New York Mets' all-time leader in triples and stolen bases. Hand signed Colorado Rockies horizontal 8x10 photo with a blue sharpie by Troy Tulowitzki, includes a certificate of authenticity. Nicknamed Tulo, is a Major League Baseball shortstop for the Colorado Rockies. Tulowitzki's arm, range and instincts at shortstop are highly regarded. Furthermore, his size, ability and leadership skills have garnered him comparisons to Cal Ripken, Jr., Alex Rodriguez and Derek Jeter. 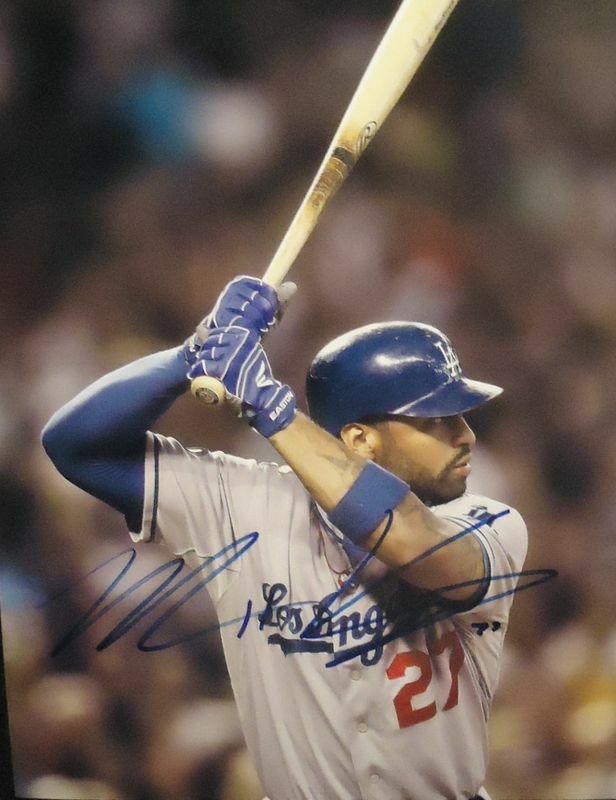 Hand signed Los Angeles Dodgers vertical 8x10 photo with a blue sharpie by Matt Kemp, includes a certificate of authenticity. 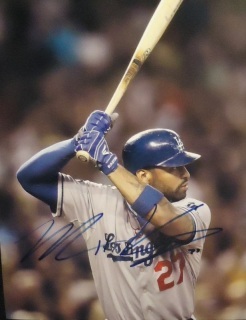 Kemp was drafted by the Dodgers in the 6th round of the 2003 draft and made his major league debut in 2006. In 2011, Kemp led the National League in runs scored (115), total bases (353), OPS+ (171), WAR (10.0), home runs (39), and runs batted in (115). Additionally, he became the first player to finish in the top two in both home runs and steals since Hank Aaron in 1963. 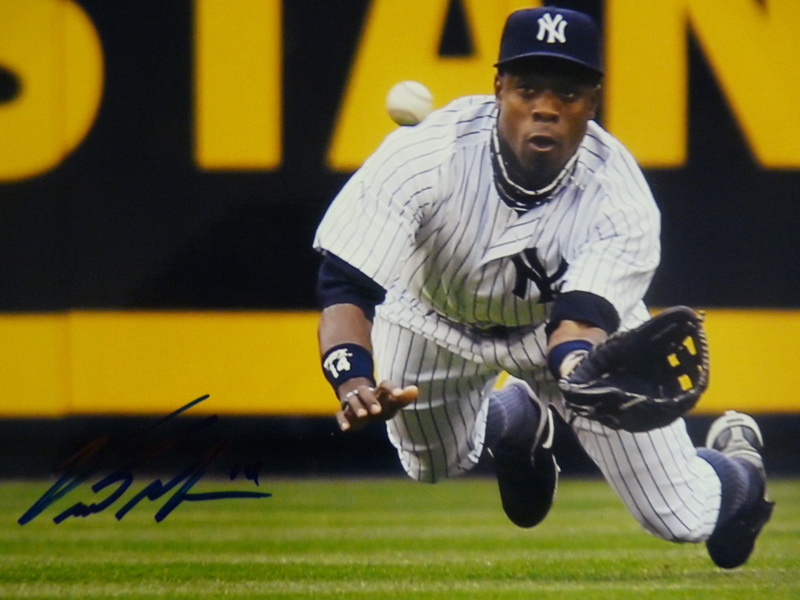 Hand signed New York Yankees horizontal 8x10 photo with a blue sharpie by Curtis Granderson, includes a certificate of authenticity. An American Major League Baseball (MLB) player for the New York Yankees. Before joining the Yankees in 2010, he played for the Detroit Tigers (2004–2009). Granderson is a left-handed batter who throws right-handed. A center fielder, Granderson is known for being a five-tool player. He is a two-time MLB All-Star (2009 and 2011) and won the Silver Slugger Award in 2011. Hand signed New York Mets horizontal 8x10 photo with a blue sharpie by Jose Reyes, includes a certificate of authenticity. 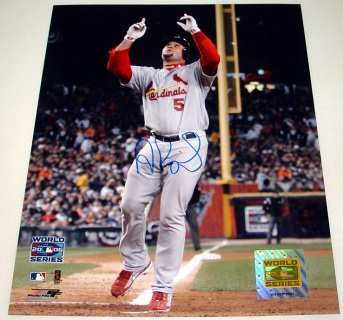 He is a four-time All-Star and led the major leagues in triples in 2005, 2006, and 2008. Reyes also led the National League in stolen bases in 2005, 2006, and 2007. He was the NL batting champion in 2011. He is also the New York Mets all-time leader in runs scored, triples, and stolen bases. 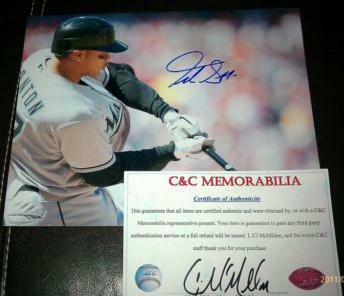 Hand signed Florida Marlins horizontal 8x10 photo with a blue sharpie by Michael Stanton, includes a certificate of authenticity. 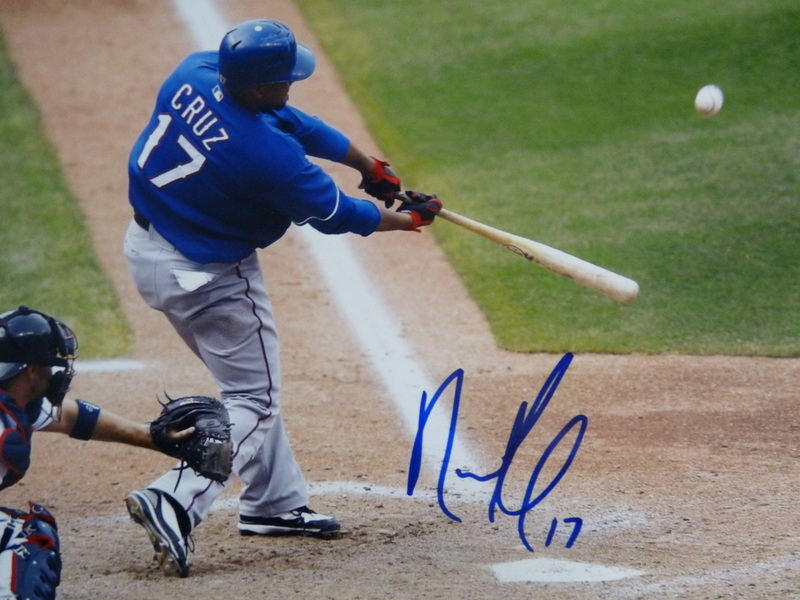 Hand signed Texas Rangers horizontal 8x10 photo with a blue sharpie by Nelson Cruz, includes a certificate of authenticity. A Dominican professional baseball outfielder for the Baltimore Orioles of Major League Baseball. 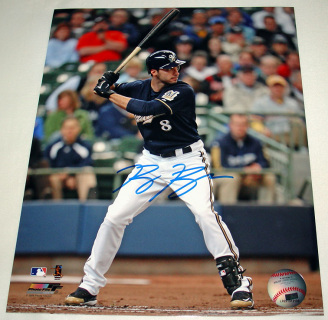 He has also played for the Milwaukee Brewers and Texas Rangers. Cruz was named the MVP of the 2011 ALCS against the Detroit Tigers. He had 6 home runs and 13 RBIs in that series. Hand signed Atlanta Braves vertical 8x10 photo with a blue sharpie by Jason Heyward, includes a certificate of authenticity. Hand signed Tampa Bay Rays vertical 8x10 photo with a blue sharpie by Jeremy Hellickson, includes a certificate of authenticity. 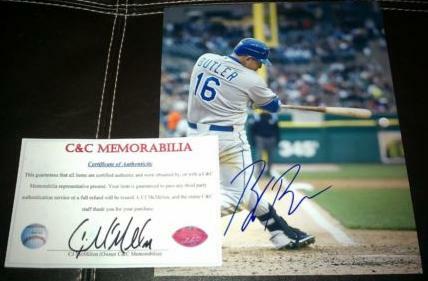 Hand signed Kansas City Royals vertical 8x10 photo with a blue sharpie by Billy Butler, includes a certificate of authenticity. 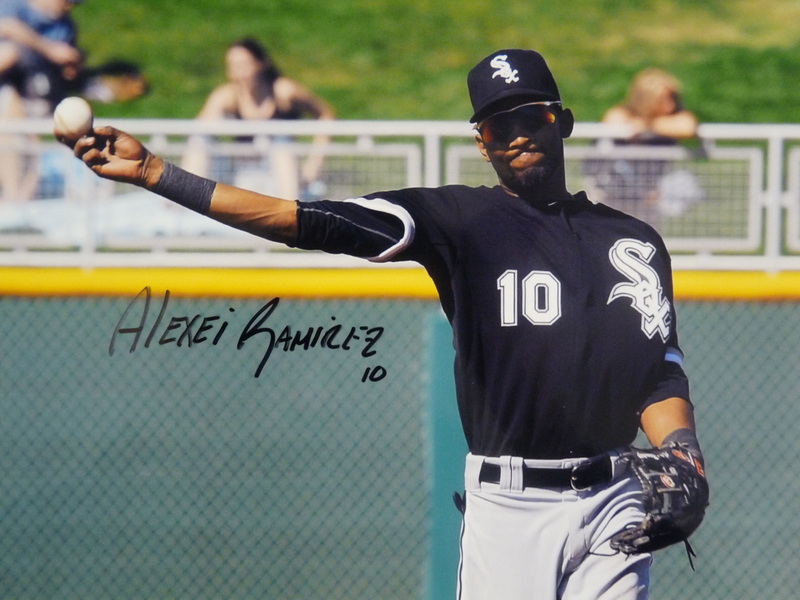 Hand signed Chicago White Sox horizontal 8x10 photo by Alexei Ramirez with a black sharpie, includes a certificate of authenticity. Hand signed Chicago White Sox vertical 8x10 photo by Adam Dunn with a blue sharpie, includes a certificate of authenticity.